If you’re thinking about starting on the vegan diet, there may be a few questions popping up in your mind. For one, how do you get enough protein? And for another, how do you make sure you’re eating a high protein vegan breakfast everyday? Just because you’re eliminating meat and animal products doesn’t mean you’ll be missing out on protein! In fact, there are plenty of health benefits of following the vegan diet. 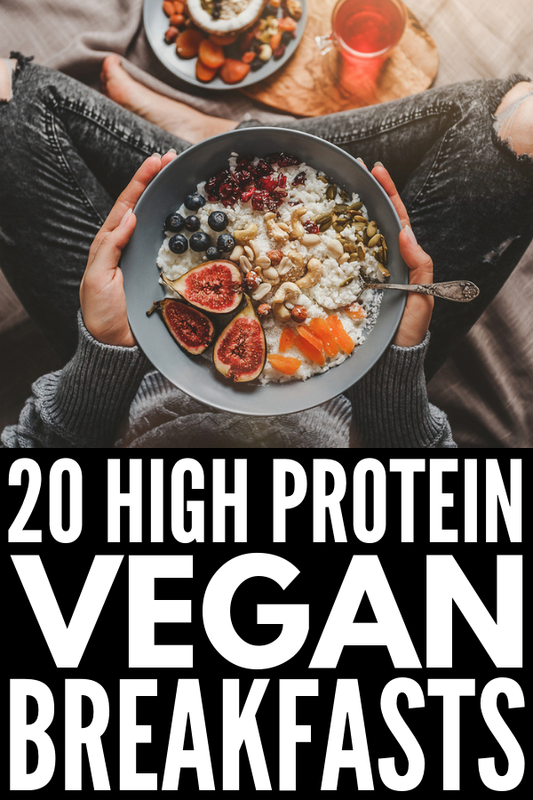 Read on to find out how you can ensure you eat a high protein breakfast every day while still sticking to your vegan diet goals. The vegan diet is a fully plant-based diet. It’s centred around whole plant foods like vegetables, fruits, whole grains, legumes, nuts and seeds. It eliminates all animal products from beef and chicken to mayonnaise and cheese. Yep, that means no meat, no eggs, no dairy. Anything that comes from an animal is – quite literally – off the table. What Is the Difference Between the Vegan and Vegetarian Diet? While vegans are fully plant-based, vegetarians don’t eat animal meat, but still consume animal products such as eggs and cheese. There are different types of vegetarian diets, from the pescatarian diet, that allows fish but eliminates meat, dairy and eggs, to the ovo-vegetarian diet that excludes meat, dairy and fish, but allows eggs. What Are the Health Benefits of Following a Vegan Diet? There are quite a few benefits of following a vegan diet, which we highlight below. Keep in mind, there are ways to do the vegan diet in an unhealthy way. If your diet is high in carbs, junk/fast foods, fried foods, processed foods and high-fat foods, it’s not a healthy diet. These health benefits only pertain to a diet high in good-for-you, whole plant-based foods. Did you know that by eating less meat, your body doesn’t have to expend as much energy digesting food? Plant-based proteins are easy to break down and chock full of energizing properties. You get a burst of energy without a crash, compared to the sluggishness you can feel after eating meat-based protein. When you eliminate meat and animal products, you have to rely on other foods such as vegetables, fruits, whole grains, beans, nuts and seeds. These foods offer more fibre, antioxidants, potassium, and essential vitamins like A, C and E.
This is only if you stick to nutrient-rich, whole plant foods of course. If most of the food you’re eating is in the form of carbs and fast food vegan options, you risk not getting enough vitamin B12, iron, calcium and zinc. Since the vegan diet focuses on whole plant foods, those who follow it often eat healthier all around. Vegan diets have a tendency to reduce your caloric intake, making them effective for aiding with weight loss. Vegan diets have been found to lower your risk of heart disease through fresh fruits, vegetables, legumes and fibre. The vegan diet has also been shown to help lower blood sugar, LDL cholesterol, and total cholesterol levels. Since a healthy vegan diet increases your fibre intake, it can improve digestion and your gut health. This lowers levels of inflammation and decreases bloat! Along with whole foods, there are other ways to get a healthy protein breakfast in. These 10 sources of vegan protein will be your saviours on days where you need something quick and on-the-go! If you’ve been searching for vegan protein breakfasts to fuel your day, look no further! Try these awesome recipes and vegan protein sources to ensure you feel great every morning! If you loved this post on high protein vegan breakfast ideas, please share it on Pinterest! And if you want more healthy tips and recipes, make sure to follow our Health Board on Pinterest!